"Tell the truth the first time and then you won't have to remember what you said." That's a quote attributed to the famous Speaker of the House (U.S.A. House of Representatives) Sam Rayburn. That's basically what God's wisdom is trying to teach us in this passage. 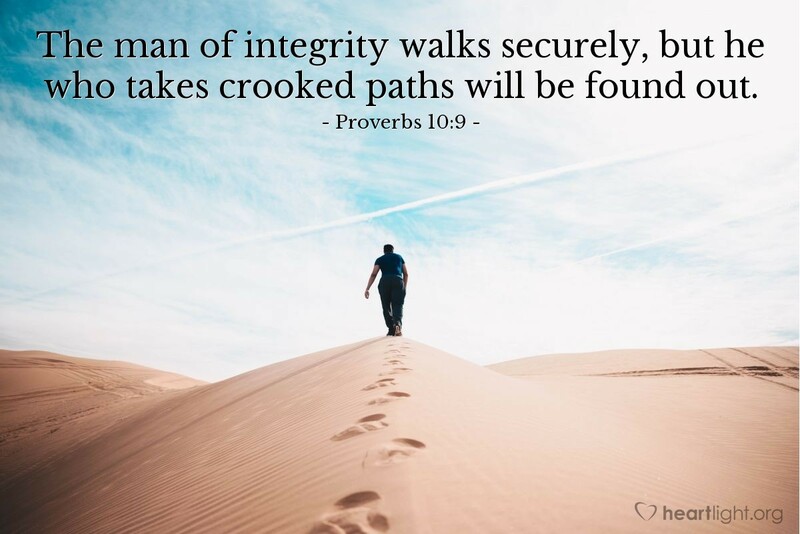 Be a person of integrity. Then, when someone finds out your secrets, you can feel secure knowing that you have lived for godliness. However, a perverse and deceitful person has to constantly worry that someone will find him out. There is no security or assurance in crooked paths, only the certainty of getting tripped up and caught. When the secrets of evil that have been whispered in dark places get shouted from the rooftops, those who have lived for the Lord can be secure, knowing that what gets shouted about them is said with the voice of God: "Well done, good and faithful servant!" Please forgive me, dear God, for those times that I have been secretive and dishonest. Purify me of deceit. Help me speak only what is true and appropriate. Transform my evil secrets, through your holy grace, into a holy character that is the same both in public and private. In Jesus' name I pray. Amen.